At the Washington and Oregon border, just north of the Bridge of the Gods. In all honesty, Michelle Turley knew there would be no beach bungalow in her honeymoon when she married Scott Williamson on the shore of Donner Lake in early June. For Scott is a thru-hiker, nonpareil. He’s walked the length of Pacific Crest Trail nine times. He’s the first one to have completed a yo-yo of the PCT in one season (5,300 miles, from the Mexican border to the Canadian border and back). And he did it not once, but twice. Dare to marry Scott Williamson and the term “getting hitched” takes on an entirely new level of meaning. 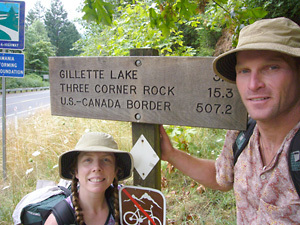 So on June 28, the Truckee residents began their honeymoon walk, headed south from Canada. In mid-August, we caught up with them (by phone and email) at Shelter Cove Resort in central Oregon, approaching the half-way point of their first matrimonial adventure. Michelle was resting bruised feet and taking a few days off, while Scott stopped for a day and then headed down the trail again, where Michelle hoped to rejoin him soon. Feet willing, they hope to arrive at the Mexican border in late November or early December. ASJ: Why did you choose to head south from Canada rather than north from Mexico? Michelle: Scott chose to go south because he feels it is easier over all. Even though you do start in snow he believes that it is easier and overall you walk in less snow. I believe that Scott’s experience helps to make this statement true. Someone with no mountaineering experience may disagree. ASJ: How has the hike gone so far? Michelle: Besides the bruising of my feet and the pain related to it, the hike has been phenomenal. At this point, we have only hiked through Washington and half of Oregon. The views have been breathtaking. Being that we did start in the north, the beginning of the hike was extremely challenging physically. On our second day out, we were hiking through a lot of snow and crossing steep passes. We ran into a few other hikers who turned back due to the difficulty of crossing Rock Pass. We later heard that a number of other hikers turned away as well. One of the hikers we met went back to Manning Park to resupply. He knew Scott would get us over the pass, so he hiked back the next day and traveled over the pass with us. I feel so extremely lucky to be with Scott. We also ran into a lot of blown-down trees in northern Washington due to the 100-year storm they had last year. At one point, we were traveling only about a mile an hour due to the fact that the trees were in huge piles every 25 to 50 feet or so for about 10 miles. Once we entered mid Washington the conditions settled down and we could just hike. Physically, I have become stronger and the days have become easier. ASJ: Scott, after hiking the PCT numerous times before, most all of it solo, what has it been like to do it with your new wife? Scott: Even though I have hiked the PCT nine times prior (1993, ’96, ’97, ’98, 2000, 2004 twice, 2006 twice), this hike has had some challenges for sure. I have found out that hiking someone else’s pace, which is significantly different from my normal pace, actually tires me out more than if I were doing my normal pace. Recently, when Michelle sat out for a few days to rest her feet, I opened up to 40-mile days and was shocked to find myself feeling much better than I did hiking 25 miles in the same 12-14 hour period. This makes me think that the amount of time spent on the feet plays almost as much of a role in fatigue as does the number of miles done. One of the benefits (of hiking with Michelle) is I have been able to do a side trips to places I have never gone and spend time off in the towns and stops along the way. ASJ: What kind of mileage are you averaging daily? Michelle: We started the hike doing about 14 to 18 miles a day due to the snow. Right before I came off the trail for a couple of days of rest we were doing 26 miles a day. ASJ: Since your traveling as newlyweds, have you made any concessions to comfort, such as food, shelter or a camp stove, compared to Scott’s previous trips? Or is it Scott’s usual dinner – dehydrated beans, tortilla chips and olive oil – for two every night? Michelle: Scott has kept his normal routine. I chose to veer away a little and add some comfort. I am carrying a stove and do cook every night. I couldn’t stomach his beans everyday. I bought organic meals from Mary Jane’s Farm and look forward to them every night. I also carry a Thermarest for some sleep comfort. I also carry more clothing than Scott because I do not like to be cold. I am very grateful that I did so because I have used every piece. The other thing I brought that Scott doesn’t use is a SteriPEN for purifying my water. I do not want to get sick and feel safety is important. Scott: Michelle is eating a diet somewhat more varied than mine. As for myself, I am eating my normal no-cook diet. Michelle is carrying a stove and does cook some. We planned our meals separately and have our own food. We do end up sharing but I think it is important that on the trail you have your own meals so that no conflicts arise. Food becomes so important out here! I am carrying my normal gear load and have not added any ‘comfort’ items. To me, these would add discomfort while carrying them! ASJ: What’s been the best part of the trip so far? The most challenging? Michelle: I would have to say the most challenging was northern Washington. Everyday was a struggle but on the other hand it was also the most rewarding. I am really proud of myself that I made it through. The best part is spending everyday with my husband. We have learned so much more about each other and I feel that the hike has brought us closer. We spend our days laughing and telling stories. It’s the best! Plus, I feel so grateful to see the backcountry of the Pacific Crest Trail. It has been something I will never forget. Scott: Best part of the trip so far? Hmm, probably the first 250 miles in the North Casacades. The most challenging? Starting out in four straight days of rainy, sleeting weather, and hiking in snow from the first day out. ASJ: Michelle, has the experience matched your expectations? Michelle: I think the experience has exceeded my expectations. Nobody can comprehend the long-distance hiking experience until you do it yourself. I had no clue as to what to expect and the experience so far has already changed my life. I have so much respect for all the hikers who take on long distance trails – for the ones who try and fail and the ones who make it. It is not an easy endeavor. Everyone who does get to experience it in their life is lucky to do so and should be proud for just doing it! Before this hike I had no clue as to what Scott was actually doing everyday on the trail. I know that sounds crazy but it is true. I knew he was hiking high miles in the most beautiful places but the everyday living on the trail I could not grasp. Now he is my hero! I now understand why people are so in awe of him. I am as well. ASJ: Any words of wisdom for other couples who might consider such an adventure? Michelle: You must have considerable patience with each other. Times will not always be easy, but when you stop and realize where you are what you are doing and how lucky you are, things seem to melt away. Okay, sometimes it takes some time for the frustration to melt, but I have found that the scenery and the walking takes care of it. Scott: Tough question. I would say have lots of patience and make sure you precondition, carry as light of a pack as you can get away with, and be ready for unexpected challenges. ASJ: Any other highlights, such as wildlife, storms or people that you’ve encountered along the trail? Scott: One of the interesting wildlife encounters was waking up to a six-point buck looking me in the eyes from only 7 feet away. Deer at a distance don’t look very big, but up close, looking me in the eye, this buck commanded respect. He walked off as I tried to grab the camera to take a photo. As for people, I really enjoyed running into my good friend Joe Kisner (AKA “Tattoo Joe”), as he made his way north on the final 500 miles of his record-breaking hike. Joe started at Mexico on May 19 and finished on August 7, hiking the trail in something like 79 days and 22 hours. He broke the existing “unsupported PCT thru-hike record,” which had been a little under 81 days. The “supported” record held by David Horton is 66 days, 7 hours. STAY TUNED: Look for an update on Scott and Michelle’s trip in the Nov./Dec. issue of ASJ.